Taken in Stilson Canyon with infrared film, 1991. My camera was on a tripod so I could appear in the frame. 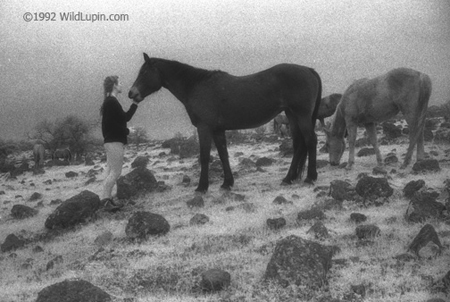 Moments later, another horse decided my camera would make a nice head-scratcher. I looked on in horror as my camera fell lens-first onto the rocks. This marked the end of my photography career for a little while. All photos ©1999-2007 Carla Freestep. Please email WildLupin@aol.com before using these images.